Remember those old tiles that were on my kitchen floor? On Sunday when I was taking pictures, I noticed that a few of them were completely loose. They were literally just sitting on top of the subfloor and could be lifted right off. So I did just that. I lifted them up to see what was underneath. It was seriously the quickest and easiest old flooring removal I’ve ever done…EVER…and IT.WAS.AWESOME. Talk about immediate gratification!! So I headed home, so proud of myself for my accomplishment, and so excited about my amazing discovery so full of potential. The last person who said that was the house inspector. And for some reason, I thought he probably knew what he was talking about, so I took his word for it. That thought nagged at me in the back of my mind for the rest of the day. The next day (Monday) that nagging in the back of my mind became more of a constant shouting in the forefront of my mind. And Monday night, the shouting was so loud that I couldn’t sleep. At all. I lay awake tossing and turning, until finally I just decided to give up on the pursuit of sleep and I got on my computer and did some research (until 6:30am!!). It’s actually impossible to tell whether or not tiles are asbestos tiles just by looking at them, but the age of these tiles certainly falls within the time period when asbestos tiles were widely used. I would suggest you have those tested before disturbing them. And keep in mind that it’s not just the tiles that contained asbestos back then, but also the adhesive they used. So yesterday, I decided that worrying wasn’t really accomplishing anything. It was time for action. So I gathered up a sample of the tile and a sample of the adhesive and took them to the asbestos testing place here in town. That way I’ll know for sure. If they are asbestos tiles, there’s not really anything I can do about the tiles at this point. I can’t really unring that bell. But having that knowledge will help me develop a game plan from this point forward. Put on protective clothing, gloves, and a respirator thingy, and carefully bag up the tiles, taking every precaution so that I don’t break any tiles. Purchase an adhesive remover specifically made for removing asbestos adhesive. Suit up in the appropriate protective clothing, and remove the adhesive. Once the floor boards are clean, order an air quality test that specifically tests for airborne asbestos (and other contaminates). If the levels are above the safe zone, call the inside air cleanup people and have them do what needs to be done to remove it. Now I’m not really worried about health issues or anything at this point. After doing my research, I’m well aware that it’s prolonged exposure to airborne asbestos that causes major health problems. And by “prolonged,” we’re generally talking about years, like people who have worked in a job that required them to be around asbestos. But it’s certainly something that I don’t want to take a chance with, especially considering that once the asbestos is airborne, it can stay there for years and years. So anyway, I should have the results sometime tomorrow. Previous Post Goodbye, Green Carpet! Hello, Original Hardwood Floors! I am in the process now of taking asbestos tiles off a garage apartment in order to take it down and believe me, it’s not as easy as just removing and dumping them. After the asbestos test, federal guidelines say they must be discarded in an approved asbestos dump after being disposed of into a sealed .06 mm plastic encasing. I had to have a permit from my town to remove them, had to pay an asbestos abatement company to remove and discard the tiling and issue a manifest which the town required showing they had been discarded of appropriately–all this BEFORE issuing a permit to tear the building down–so I would say, be careful and get the advise of a knowledgeable asbestos removal company. GOOD LUCK! Wow! It’s hard to believe that you had to jump through so many hoops for a building that was being torn down!! In my line of work we have to have asbestos abatements done on our facilities if they come back positive. In the training I’ve had in my secretary position, I know that asbestos only is an issue if it becomes friable. That means it has to be “airborne”. Typically if you are popping up tiles without breaking, grinding or sawing them; there would be no friable material. You are safe health wise. However, disposal wise may be an issue with your local EPA or state department. I also want to give you a heads up on any potential work you may be doing in the crawl space, be sure to use protective clothing and respiratory protection. This spring after working days under my grandmother’s house, my dad got sick. He was initially diagnosed with pneumonia, when it didn’t clear after antibiotics, inoperable lung cancer. The good news is after two months, it cleared up, doctor said it was most likely a fungal infection. Oh, I can assure you, I will NEVER get in that crawl space! 😀 If a project requires that someone crawl down there, I’ll be hiring it out. I just lifted the cover off the crawl space and peeked down there, and just about had a panic attack. And I’m not prone to panic attacks. There’s absolutely no way I could actually crawl down there. I’m not too concerned about the tiles, but I’d just like to know if I can sand up the adhesive or if I’ll need to find another way to remove it. Obviously sanding it would stir up a whole lot of dust, so if it’s asbestos adhesive, I want to avoid that. The mastic(glue) can contain asbestos too. It might be best to have that tested before sanding. However if you “wet sand” it, there would be no dust. 😉 Just keep it damp so nothing becomes airborne. Keep a spray bottle handy. Wipe stuff down with a damp cloth and use a mask. If you vacuum up anything make sure you use a HEPA filter to avoid recirculating it back into the air. I have often wonderd that same thing about the tiles I removed form our kitchen in 1989. They looked exactly like the ones you show in your photo. I wondered about it after they were removed and hauled away in the trash. Many came up easily and in one piece. Others required much chiseling, etc. I sat there in regular clothes and wore no mask. I guess I will never know, but that expereince has caused me to question things more and research what I am digging into. I actually have lung problems now, but it is caused by histoplasmosis, a fungus that lives in soil and bird droppings, particularly common in the Midwest. To protect myself while doing home improvement projects I always wear a mask and gloves and shower promptly. I love to follow your projects and can’t wait to see the wonders you will work in your new home! I wish you the best! While having asbestos in your house isn’t a good thing, you don’t really need to be concerned about the tiles in your particular situation. Asbestos causes lung cancer, yes. But only if you breath it in in certain quantities. It would need to be in small particles (powder) to be a danger to you. Because your tiles are mostly whole and you weren’t breathing in dust in an enclosed space, I think you’re fine. Wash your hands well and have the tiles tested to determine the proper way to dispose of them. I’m actually not too concerned about the tiles (although I’d like to know if I need to dispose of them in a special way). It’s the adhesive that I’m concerned about. I was planning on just sanding the entire kitchen floor at the same time I sand the floors in the rest of the house, but if it’s asbestos adhesive, I’ll need to find another way to remove the adhesive since sanding would send quite a bit of it airborne. You may not be interested in tile at all, but it would be the easiest way to solve the problem. You could just nail down a 1/4″ plywood overlay down on top of the whole mess and then lay tile on top. I think if you encapsulate the stuff it is safe. Opps! Just read that you can’t raise the floor, sorry. I’m hoping they are not asbestos, but on the bright side, even if they are … they’re already up! Will save you a ton of abatement money! Thankfully, the kitchen is the only room that has these tiles. I think you did the right thing in sending the tiles to get tested. My dad and uncle worked for an asbestos company, my uncle passed away from lung cancer and my dad is under careful watch, having so far avoided any problem, but he just worked in the building, not with it like my uncle did. So it is good to be on the side of caution. Good luck with this situation! I can understand your concern, but comparing what is written in the article to what happened to someone who spent years in an asbestos filled environment is not very relevant. Morgane, I’m so sorry to hear about your uncle! So sorry about your uncle, Morgane. I do think it takes more that just a one-time exposure to it in order for it to pose a serious health risk. As you said, your uncle actually worked with asbestos, so I would assume he was exposed to it for several years on a continual basis. I really think this little bit of tile removal won’t post a serious risk. But I do need to know how to safely discard the tiles, and how to safely remove the adhesive so that it doesn’t stir up more asbestos-filled dust in the air. The test will determine whether or not I can use a sander, or whether I’ll need to find another option for adhesive removal. I apologize for being off topic, I guess it triggered an emotional reaction! My thought was about the potential air contamination, and you and your husband ‘s potential exposure. Oh my goodness, no need to apologize! And I didn’t think it was off topic. It is true that once asbestos is released into the air, those microscopic particles can stay there for years and years and years. I’m just trying to comfort myself with the thought that perhaps the small amount released by those tiles and adhesive is quite different from the amount encountered by someone who actually worked with the substance over many years in their work. But I do think once it’s done, I’ll still order an air quality test just to be on the safe side. 🙂 If it were just me living there, I’d probably not really worry about it. But since Matt will be there, and he’s already dealing with compromised health, I’d rather err on the side of caution. There is very little to worry about. Because of the way it’s manufactured the asbestos tends to be bound up in both the tiles and the adhesive. And as is pointed out above, it’s prolonged exposure that gets you, not short-term. I actually disagree. If you read about asbestos, inhaling even one microscopic fiber can lodge in your lungs and then turn into an incurable cancer 30 or 40 years later. I lost a parent to mesothelioma–an asbestos related cancer. He must have been exposed in his 20’s or 30’s and then was diagnosed with a horrible cancer at 57 that we couldn’t do anything about. He didn’t work with toxins or have any prolonged exposure. He largely worked in schools as an educator and later in his own office. Personally, I wouldn’t get anywhere near an asbestos product nor would I do any home improvements if asbestos were present in any form. It is best to have an expert evaluate and then hire professionals to perform a safe removal. Sadly, asbestos is still legal in the US and Canada, but most other countries banned this material years ago. I hope one day we will ban it as well. You might consider having the ceiling tiles tested as well if you plan to remove those in the future. No, the inspector isn’t liable. The fine print on their inspection reports say very specifically that they don’t test for asbestos, lead paint, and other contaminates. I knew that, but I decided to just ask for his unofficial professional opinion. I knew he couldn’t legally give me a definitive answer. These tiles look just like the ones i have been worrying about in my basement!! How did your test results come out?…. If they were negative this might take a little worry away from me but I will still have them tested. My tiles were asbestos, but the adhesive tested negative for asbestos. Oh I can so relate to this. My husband and I live in an old apartment building and our apartment has ceiling tiles. Well after a few days of looking at these tiles and thinking “hey looks like they are drooping”, I came home to find that every single tile had dropped onto the floor. It was a mess and my first thought was “crap asbestos”. Thankfully, they were not!! Best of luck! I wouldn’t have been able to leave the tile alone once I figured out I could pop them up so easily. I’m glad you posted this because I didn’t know there was asbestos in floor tiles. I thought it was only ceiling products. Thanks for enlightening me. I have dealt with asbestos tiles/adhesive, and because it was in a commercial setting, we had to hire an asbestos removal team, have the testing done, etc., and it ended up costing somewhere around $6,000. However, in Texas, if this were in a residential area, it would not require a hazmat team to do the removal, but a homeowner could have done it. I was also told that the amount of asbestos that I could have been exposed to removing the tiles myself would have been equal to about the same amount of asbestos I would have inhaled while standing on a street corner in New York for a few hours. (Asbestos is still used in brake rotors because of its durability, and applying the brakes releases some asbestos into the air.) If you have to deal with anything else (sanding the floor for example), I would suggest using a water misting bottle to settle any dust, wearing a good quality mast and then showering immediately after the job is finished. Of course, this advice is predicated upon the statements made by the professionals to me being true. Best of luck to you!!! Exactly right…the guy at the environmental consulting place where I took my samples said that asbestos removal in residential homes isn’t regulated, so homeowners aren’t obligated to call the pros to do it. I was planning on sanding the floor, but right now, I’m just going to wait for the test results to see how I need to proceed. I’m glad it’s just in one room!! Whew. Thank you. I have been merrily peeling up the sticky tiles someone put down in the late 70’s until I ran across asbestos info on sticky tiles on the web. The house inspector said absolutely nothing about asbestos tiles when we hired him for $400 to inspect the house. I specifically asked him about where we might expect to find asbestos. He said plumbing insulation perhaps., while standing on the asbestos sticky-tiled floor. Really appreciate this post and discussion. It helps a lot. I was getting ready to panic. In Texas there are so many law dealing with environmental issues. If your house was built before 1978, you need to have it tested for lead paint before you cut into any walls, etc. Also, Asbestos is always an issue. I hope those things don’t add too much to cost of your remodel. I don’t think I would really worry about your health even if those tiles are Asbestos. Since you didn’t break them or anything, I can’t imagine that it could cause any problems. Just like you, I would never have thought about it before taking them up. Good Luck! If the tiles are original there is probably a better than 50/50 chance that they contain some asbestos and that the glue has a lotof asbestos. fortunately, if they came up that easily, you probably didn’t launch much of it in the air. Hope your tests turn out negative and that it won’t be a problem anywhere else in your home. I can relate to this, too!! I moved into this house almost 21 yrs ago and was told the old vinyl in the kitchen tested positive for asbestos, but if I left it alone all would be well. It bothered me a bit, but this is the only house we could afford. 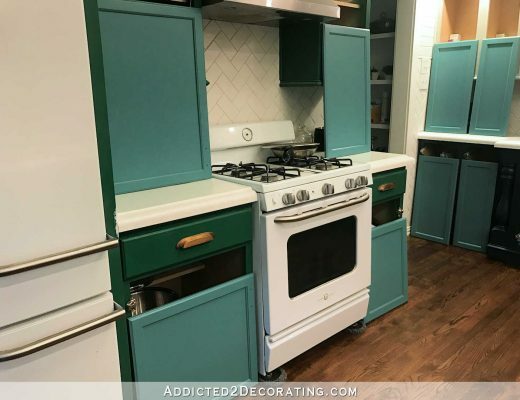 So, I remodeled the kitchen (with lots of help at that time) and chose to just run affordable sheet vinyl (eww) over all the old stuff so as not to disturb it. 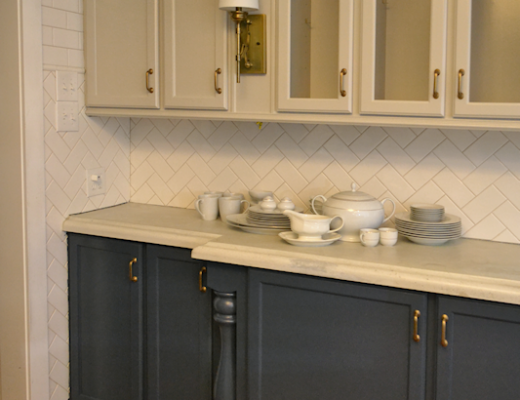 Now, FF to now, and I am embarking on another remodel of this kitchen. Total DIY this time. And as much as I wished I could just rip out all the old flooring and get down to the subfloor — I knew I couldn’t do it safely. And I sure as heck don’t have the funds for asbestos abatement. Doing a very budget-minded DIY remodel, so I decided my best bet was to just put my hardwood floor right on top of all of these layers of old vinyl. Yes, hell-O step-up into the kitchen!! Anyway, I just finished demo’ing the whole thing myself a couple weeks ago. And much to my HORROR (!) after I removed the cabinets I discovered that during that first remodel some of the old flooring had, in fact, been ripped up!! Without my knowledge. I hired lots of people to do stuff back then, and sometimes work was done while I wasn’t in the house, and obviously someone had taken it upon themselves to rip up parts of the vinyl. So, after my demo I realized w/ a heavy heart that I (and others in my family) have lived in this house for 20 years w/possible asbestos contamination. **bangs head on wall** But there isn’t a dang thing I can do about it now. Damage, if there was any, has been done. Perhaps it wouldn’t even matter if I just went ahead and ripped it all out now. ?? But I’m not going to. Still plan to just lay the new floor on top (while saying a couple prayers!) and then go on and live my life and hope for the best. Sighhhhhh… Old houses. Love em, hate em. I wish you luck with your results…crossing my fingers for you! I know this is an old thread, but really there is nothing to worry about. No, Asbestos doesn’t stay lingering in the air for “many years”. It settles just like every other type of dust. Open all of the windows and let the house air out, wash the walls and floors and countertops, etc… Just air out the house and give it house a good hearty dusting and you’ll be fine. 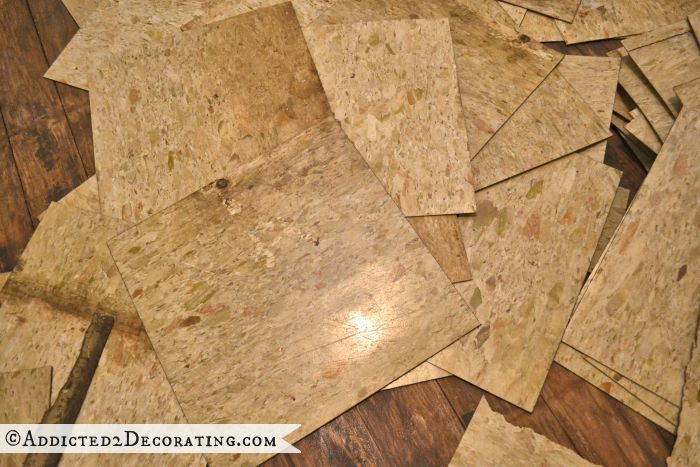 If you have carpet, have it cleaned well, and/or throw it out and replace with tile or hardwood. If some asbestos was “disturbed” when your house was remodeled before, the air is no more contaminated than it would have been from having the flooring installed in the first place. ..will poly seal it not to worry if it is asbestos? And if I need to get it tested,where? Kristi, I love your site because I feel like I learn so much from you. I live in a house that is about 104 years old, I never even thought about asbestos being in the floor tiles. So smart of you to find out now before moving forward with all your DIY projects. Can’t wait to see the transformation of your house into a home. Yikes! The wait for the test results would drive me crazy …. I would probably camp outside the company door (most likely looking like a crazy stalker). However, the floors do LOOK great without the tiles and you weren’t there too long and you are a diy super hero soooo … I am sure it will be all good! I would never have known to even think of asbestos. 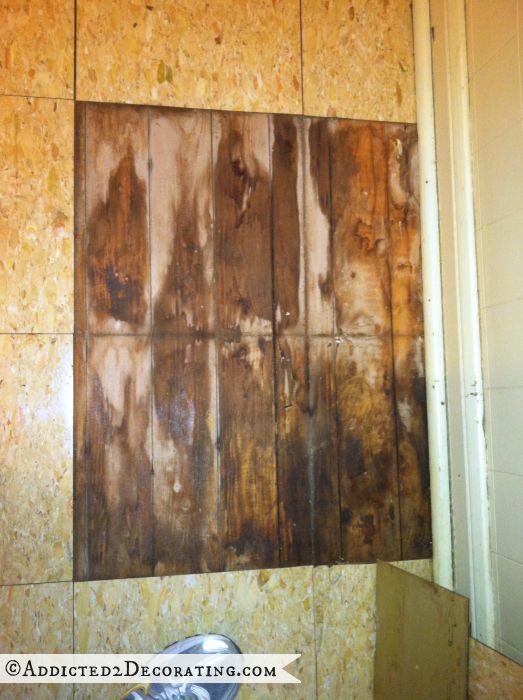 Thanks for posting the negatives as well as the positives of your home fix-ups. I learn every time I read your blogs, and I continue to marvel at your energy and imagination. Best of luck! 🙁 I guess you don’t read all your posts… I wrote this on Monday. I am not worried about you or your husbands health… everyone above is right about it not being enough to worry about, but the COST of removal, etc. is going to be terrible if it is asbestos. If you had just tiled over, you would not have had the extra cost. But positive… you get cool wood floors in your kitchen! Building up the floor wouldn’t really work anyway, because it would create an uneven floor, which would be a real hardship for Matt. As it is, all of the floors through the original part of the house are completely smooth (with the exception of the hallway bathroom, which he won’t use anyway), and I really need to keep them that way so that he can maneuver around easily. 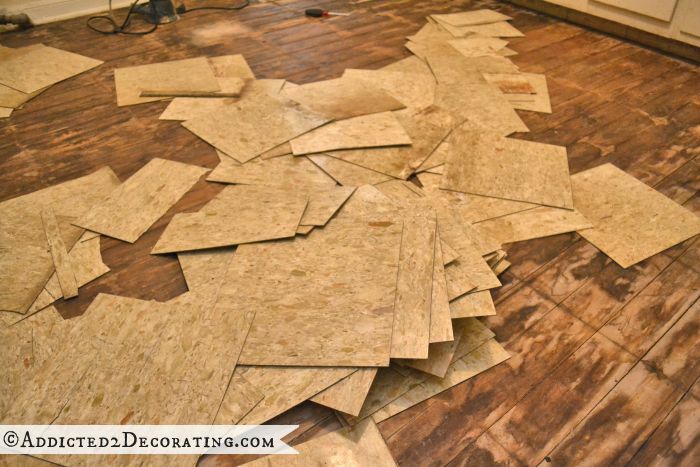 Adding raised flooring, raised thresholds, etc., really isn’t an option. So basically, I have to make these floor boards work, even if they are covered in asbestos adhesive. It’s just a matter of figuring out the safest way to get the adhesive off. Oh, and I forgot to mention…I took all of the tiles up on Sunday. 😀 So by Monday, when I read the comments from you and others warning me, the deed had already been done. *Sigh* Oh well. I’ll just move forward from here. 🙂 OHH! Well there you go! I pray that it is not asbestos… b/c then it is going to cost a lot and you will probably have to put some projects on the back burner to recover from it… which makes me sad b/c then I don’t get to see all your cool work!! (See way to make this all about me!) I totally understand about the uneven floors… you are right- we did have a change in threshold b/c we added about a 1/2″ of concrete board then tile over it! So this was your best option to begin with! Again.. do NOT stress about the health concerns… It was not enough to even worry about (and probably never went airborne in anyway). So cool to be corresponding with you!! I LOVE EVERYTHING YOU DO AND ASPIRE TO BE LIKE YOU! I know this house is going to be everything you and your husband deserve! Praying for a good turnout tomorrow! My whole house is sided in asbestos tiles, it was built in 1944 and while I don’t think it was originally built with asbestos siding at some point over the years it was added :o( I have been told that if I ever want to change it to just put new siding over the top. I have some spare tiles in my shed and while I did take them out and wash them off when I first moved in I have not attempted to replace any on the house. They look like peel and stick tiles my sister put in my mother’s house years ago, same pattern,I don’t think they are asbestos. Are they 12×12 tiles? The 8×8 or 9×9 are usually the asbestos ones. Yep, these are 12 x 12, so they could go either way. If they had been the 9 x 9 ones, I could have saved my money on the testing! 🙂 But I’m glad that there’s at least a chance that these don’t have asbestos. Good grief, I probably never would have though of asbestos for floor tiles either. You have to promise to post the results as soon as you find out as we’re all holding our breath waiting to hear the test results. Back when I was in college, they had to spend huge amounts of money re-doing the interiors of every single older building due to the presence of asbestos. However, apparently they didn’t bother with the ancient building that held our old shop equipment. We were storing a multi-ton pneumatic drill and were just told to NOT BREAK THE TILES…. Which was a bit nervewracking. Wow, now I really am worried. I did the same thing in my office but I broke a tile. Mine seem to pop right up,too and they are old. Do you know what age they have to be to be the time frame of when they added asbestos to tile and glue? One of the biggest trends in the last ten years has been the emergence of a large home renovation market. Popular television shows have made renovating houses and selling for a profit look so easy. The problem is that these shows fail to properly cover the risks and precautions that need to take place when dealing with older homes. So, did they turn out to have asbestos? I have the same ones in my home. Yes, they did turn out to be asbestos tiles. With asbestos tiles, you have to contact your local solid waste office or landfill and get instructions on how and where to dispose of the tiles. Hi Kristi, Very interesting thread. I am Renovating a fifties kitchen in 100 yr old family home and just sent in a tile and adhesive for testing. My tiles are black wih red and white specks and only 7x7sq. Underneath I know is hardwood oak floor but was told if glue and tile are asbestos that it could have contaminated the wood floor ad they would take that up too. Would you know if this was true? Did you have any problems with refinishing the floor underneath? Guess I will find out from te abatement company this week anyway. My floor is a little over 100 sq feet so don’t think removal will be that expensive. Quoted me $5.00/sq ft. I actually don’t know whether or not that’s true. I sure hope you can salvage the original floor! I ended up taking up the old flooring in my kitchen and putting down new oak hardwood floor, but that’s not because of asbestos. 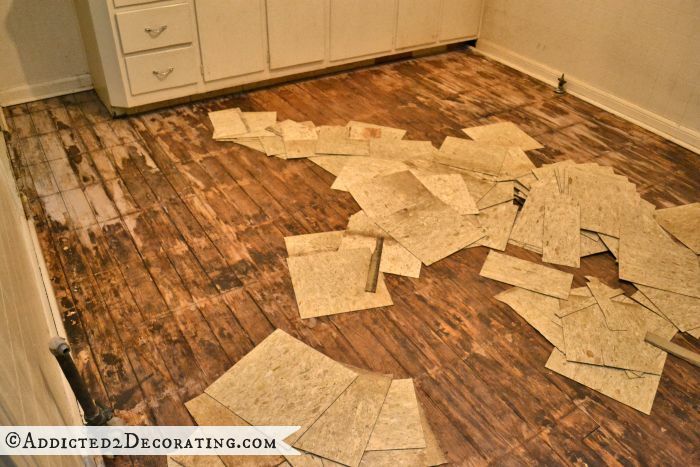 It was because the original floor was in such bad shape that it was really not salvageable. Hi Again, thanks for your reply! Actually I scanned through your site and saw the new flooring. Great idea for the strips in red oak, as you have the red oak thruout your home. Big project as this 2100 sq ft home has 100 year old solid oak floors thruout as well but currently downstairs is covered with carpet. I will be taking up and refinishing the floors soon and replacing wih area rugs at some point. Great to see such great info on your site. Will be checking in for more tips again soon! Okay, so I have to know–was it asbestos??? I’m doing a DIY project in my kids’ bathroom for my 30-Day August Upgrade Room Challenge on my blog, and I’ve got some vinyl tile that I wish I could remove but feel it would be dangerous. So I’m just going over the floor with SnapStone porcelain tiles. But I also get freaked out by things in this 1973 home. Would love to know the outcome of your tile! Yes, mine were asbestos. I wasn’t to concerned about it, though. Asbestos tiles are only dangerous if you break them and the fibers become airborne. All of my tiles came up in whole pieces. It was mainly just a matter of knowing how I needed to dispose of them. When you have asbestos tiles, you have to find a landfill that will accept hazardous material like that, and they’ll also instruct you how to bag them. After removing carpet. 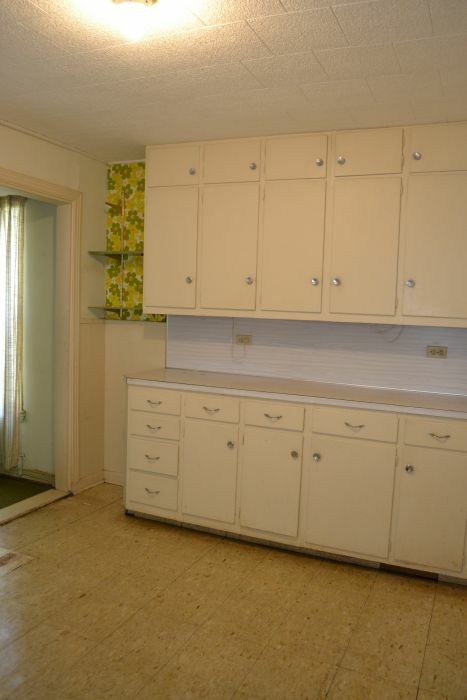 My boyfriend and I foolishly took up tile in our 1959 house. Afterwards we can to realize that it was original tile and probably contained asbestos. I was wearing a bandana mask and he was wearing nothing on his face. The tile came up easy, some just broke easily.we just swept and shoveled it up. Since doing a bit of research, I’ve had several panic attacks, severe anxiety and insomnia. All new conditions. I’m a nurse and work with many respiratory patients I’m totally freaked we ended up putting laminate flooring over the black mastic (probably asbestos constraining) ,i think if it’s covered its fine. Anyway, trying to calm down and stop the.panic. We are going through this right now with our 2nd floor in an old 1950’s cape. We are going to float flooring above the asbestos tile, but the guys working up there doing the renovation may have cracked a few tiles :/ we just noticed them today. We have the work space sealed off with plastic but the guys have come downstairs a few times trailing dust from the job. Now I’m concerned if that dust that I’ve been mopping and vacuuming up has asbestos! Any idea if that’s how it travels? Or if it’s only airborne? Even then, I doubt the plastic kept it at bay. And what the note about it lasting in the air for years and years? I’m not sure I understand how that’s possible? Christine, if they’ve only broken a few tiles, I really don’t think you have anything to worry about. But if you’re concerned about it, you can always have an air quality test done after the renovations are done. I know there’s a way to clear the air, so to speak, but I don’t really know what it entails. I’d be willing to bet that your house will be just fine as far as asbestos goes, though. Thanks for the reply. I put a call into a local company that does testing. My husband also delicately wet the floor to keep dust down. Hopefully all turns out okay. What were the results out the asbestos air testing in your home? Hello, after reading every comment, I am now worried! I attempted to remove our old carpet and found this tiles like under the underlay!!! Not thinking I then removed some of it and a few broke off!!! My 5month old baby was also at the other end of the room. I only removed about 6-10 tiles and didn’t creat dust that I could see etc, I have now sealed it off for the asbestos company to look it over! But I am extremely worried about my baby and his exposure to it! If you removed so few tiles, I can’t imagine that you would have anything to worry about. Generally, people who have issues with asbestos exposure are people who have worked with it every day as part of their job. Such limited exposure (if any) from a few broken tiles doesn’t seem like enough to worry about. However, if you just need peace of mind, you can always have the air quality tested in your home. Companies who test air quality can tell you what contaminants are in the air inside your home, and what can be done to eliminate those contaminants. I’m not an air quality expert, but in my non-professional opinion, I really think you have nothing to worry about. But sometimes it’s worth it to shell out some money for peace of mind, especially when children are involved. Thank you Kristi, we will have to do that I have moved out with my baby to my parents until the company checks the tiles out and we will take it from there, but the guilt is eating me up of how could I not have thought about it and removed them! I hope my son will be okay … I just feel so bad and so worried, even though I have had a lot of people tell me not to worry about as it would have to be constant exposure! Again thank you for you assurance ???? I too just like some of the others, pulled up, actually scraped up an entire kitchen floor of old tile. I was more concerned about the old sheet linoleum that was under the vinyl tile. I was wearing regular clothes with no gloves or mask. I am driving myself cray cray now wondering how much abestos i might have exposed to my family and to myself. I have dogs and grand kids. I called an abateman company only after i tried to have a laminate floor put down by a home improvement company. They told me if it was old vinyl or linoleum ot had to be tested or they couldnt do a thing to my floor. I also worked on this project for months only having extra time at night and on weekends. I can only pray that i nor my family were exposed. Wish there was was more info out there to warn diy homeowners. Homeowners can test floor tile, plaster or other things they think might contain asbestos easily and affordably. DIYSampleTesting.com includes interpretation and guidance with the test results. Wow now I’m freaked! I too thought oh good most are loose. I popped them off & many were broken. I scraped & vacuumed & worked in it for a couple months off & on. I never knew asbestos was in floor tiles! The house is over 100 years old our tiles were red & black and felt more like tar like held together. The adhesive was black looking?? Looks nothing like yours?? I have just found out that the ceiling in my ROOM are old asbestos tiles (amosite). It’s a warehouse, the ceiling is slanted, we often bump into it, releasing dust. They are somewhat crumbly (still good considering their age!). Some wind can be felt too, which would help in spreading asbestos dust around. I’m not sure how exactly to react. Me and my partner have been staying here for over a year. There are others in the flat but we’re the most exposed. I have another place to go but not my partner. I might post and ask about it and gather opinions. At the moment I’m just being careful to limit my exposure. I’m not sure how to deal with my stuff and with the legal/formal aspect. I think your reaction is exagerated, but a I totally understand. Better not mess with that stuff. I have kitchen tiles that are beyond cleaning. Even Stanley Steemer wouldn’t do it. They are vinyl, circa early 80s. Based on my research and talking to a couple of pros, I am 99.9% certain they have asbestos so I am going to skip the testing part and start saving for the removal and permit (which will take 2-3 years). I have been told okay to clean as long as they tiles are not damaged. This means Pine Sol (or other such cleaner and a stiff brush and GENTLY scrub to get the dirt off…Wear a mask as even just the dirt from 35 years will be nasty. Hi. I am so pleased to find this page. I too, have been running scared as my home was built in 1954, and their is 9×9 brown tile with specs of beige and orange (ugly) tile, I have some laminate and or carpet covering it. A couple months ago we renovated the bath, and tile was already gone but that black adhesive was still present, we just covered it over with new tile?? Currently redoing a hallway, (3ft x 13 ft I think), and am hoping that by just using a water bottle spray will keep the dust at bay. Take it up and putting down new tile as well. Sine this is such a small area, do you think it will be fine to do this was? I DO have COPD and have already fought a Mycobacterial lung infection, that is nothing to deal with since it damages your lungs. So therefore everything scares me. I cannot tell you how relieved I am to read your experience. (Not relieved that you had to go through it, of course, but that I am not the only person on earth who zealously ripped up flooring without even considering asbestos.) As in your case, the floor is already up and when I researched how to remove the sticky, I realized what we could be looking at. UGH! But I see you, and many others, have lived through this and I shall too! AAAAGH! That is such a scary thought that any home that has been around for a couple decades is vulnerable to asbestos. I definitely would not want any of it to get airborne during a renovation project. I’ll have to make sure that I get everything properly inspected so that I can keep my home safe. My understanding is you only have to worry about asbestos if things are broken. So the tiles are in good shape, you’re fine. And the glue, once covered, also fine. You’re overthinking the whole thing. I had similar tile and threw them in the garbage. Realistically everything in the garbage dumps is covered in asbestos and chemicals, who are we kidding. So what were the results in the end? Did the tiles test positive? Hi! I just found this site-discussion as the edge of one of my kitchen floor tiles just broke and I was worried about asbestos. My tiles look EXACTLY like yours! So while I’m not happy about the asbestos, at least it’s pretty much confirmed and I can proceed accordingly. I bought my home from my childhood friend’s mother so I know it was installed in 1979 or 80. I wonder if I can safely take up all the non broken ones (too late on the broken one!) and dispose accordingly…any wisdom appreciated! I will check back! Glad to see this is still an active site although an older (but valuable!) thread! I figure that the majority of the persons commenting on this post are from the US and I am not familiar with the regulations in your country but remove asbestos and remediate mould for a living in Australia, so hope that I can provide some clarification on some of the posted material. Asbestos vinyl tiles are considered to be BONDED materials. That is, the asbestos fibres are bound into a matrix material that is vinyl. The asbestos fibres are not homogenous throughout the vinyl tile matrix, rather there can be clumps of asbestos fibres in some places and none in others within each tile. The asbestos fibre was added to extend the life of the vinyl tile, it acts as a wear agent, it also has insulation properties and depending on the asbestos type can be resistant to acid. Being bound into a vinyl matrix the asbestos fibres can only be released to the air if the tile matrix is disturbed. That is, broken, cut, sanded, drilled, scuffed, ground etc. If tiles are removed whole without breakage there is little risk that the asbestos fibres will be released to the air. If you break the vinyl tiles up into tiny pieces when removing them (e.g. use a tile chipper) then it stands to reason that the risk of asbestos fibre release is somewhat greater. If I were to use this approach to remove asbestos vinyl tiles in a persons home, I would contain the area, seal off ducts etc. and place that area under negative air pressure then after removing the tiles, environmentally clean and decontaminate the work area. There is no legislative requirement for me to do this, I just don’t like breaking up the tiles. There are ways to remove tiles whole using heat pads for example. As for the glue or adhesive, if the vinyl tiles are degraded or have deteriorated and they are lifted/removed, small fragments can be left behind in the glue and these may contain asbestos fibres. The glue / adhesive, as has been advised elsewhere, can also have been manufactured containing asbestos. It is always best to assume that vinyl tiles contain asbestos and to treat them that way until it is proven through laboratory fibre identification testing that they are asbestos free. Also be aware that for each different coloured vinyl tile that you may have, you will need to get a separate analysis. You may find that certain coloured tiles contain asbestos and other coloured tiles do not. Glue / adhesive can be removed by sanding or grinding but there will create dust and potentially release asbestos fibre so if this is the method employed then again my suggestions would be containment and negative air pressure, followed by full environmental cleaning and HEPA vacuuming, wet wiping of all surfaces within the enclosed area (content and furniture items obviously having been removed prior to the disturbance to the vinyl tiles. The glue / adhesive can also be removed using solvent chemicals but then you have odour and safety concerns to contend with and possible environmental controls and regulations to contend with. The alternative is to remove the glue with a natural product which normally comprise citrus and or soybean basis. You need to also consider the floor surface to which the asbestos vinyl tiles are affixed. Concrete, timber etc. If you employ soybean glue removers on a wooden floor, then be aware the oil in the soy product may turn the timber a darker colour or shade which may or may not be a concern / issue. Using a product to dissolve the glue / adhesive means you need to somehow remove the resultant liquefied glue from the floor. Thus absorbent materials are required. You will find also that at the edges of a room the glue will be thicker than on the rest of the floor. Might need to repeat the process a few times at the edges. After all this, still may need to sand or grind off stubborn areas. We have dust shrouds on our sanders / grinders and connect these machines to hazardous materials grade HEPA filtered vacuums. A home HEPA vacuum should not be used as its HEPA filtration rating is inadequate for the work. We again only sand or grind within a controlled and encapsulated work place placed under negative air pressure. Last words are the definition of FRIABLE. In terms of asbestos materials, if the given material contains asbestos and it can be crumbled when rubbed between thumb and forefinger it is deemed to be FRIABLE. Friable asbestos materials can only be removed by persons holding Unrestricted (Friable) Asbestos Licences NOT persons holding Restricted (Bonded) Asbestos Licences. Under no circumstances should a none-licensed person attempt to remove Friable Asbestos materials. This is best left to the professionals given the level of risk associated with the work. Please be very careful with sheet asbestos vinyl. This product is considered to be Bonded when it is stuck to the floor but is then considered to be Friable when it is removed. The reason being that the sheet vinyl has a paper backing to it and it is this paper that is generally found to contain the asbestos fibres as well as the glue / adhesive used to stick it to the floor. The backing paper can contain up to 60% asbestos fibre and this can either be Chrysotile (white) asbestos or Amosite (brown) asbestos. When the sheet vinyl is taken up, the paper backing is disturbed and it separates away from the vinyl. There are small pieces of it left stuck to the glue, and in pulling up the vinyl asbestos fibres are released into the air. This work must only be done by a professional asbestos remediator who holds an Unrestricted (Friable) asbestos licence. If containment of the area is not in place and there is not a negative air pressure environment established, asbestos fibres can be released to migrate through the rest of the house. Amosite asbestos belongs to a different mineral group (Amphibole) to that of the Chrysotile asbestos (Serpentine). Their fibre shape is also different. The Amphibole fibres are long and needle like while the Serpentine fibres are more wavy or curly. Both fibre types can penetrate into the lungs on inhalation. The long, needle like shape just permits the asbestos fibres to travel much deeper down into the lungs. The more times that you inhale asbestos fibres the greater is your risk of contracting an asbestos related disease (Lung Cancer, Mesothelioma, Asbestosis, Plural Plaques). The first three of these diseases are terminal. The reason for the higher risk is the human body is not able to remove the asbestos fibres from the body once they have penetrated the lungs and become lodges there. The problem is, is that you cannot see with your eyes the asbestos fibres that are going to hurt you as they are microscopic (40 times thinner than a human hair). You cannot smell asbestos fibres as you inhale them, they don’t make you cough or sneeze and they have no taste. Hence the Silent Killer name given to asbestos. The more times you inhale asbestos the greater the asbestos fibre load in your lungs. Each exposure just adds asbestos to the asbestos fibres already deposited. While fibrosis of the lung(s) does start at a point where one asbestos fibre has lodged itself into lung tissue, the one fibre theory is somewhat hard to accept scientifically. It is more likely, that a person has hundreds if not thousands of asbestos fibres in their lungs and for some reason, at one of the fibre impact sites, fibrosis occurs. It is also believed that individual genetics has a part to play in why some people contract an asbestos disease and others do not. There are other factors to consider to. Is the person a smoker or none-smoker? People who smoke and who are exposed to airborne asbestos fibres are far more likely to contract an asbestos related disease than people who do not smoke and are exposed to airborne asbestos fibres. What also of the people who don’t smoke and have no known exposure to asbestos, yet they have asbestos fibres in their lungs and they do not contract an asbestos related disease?